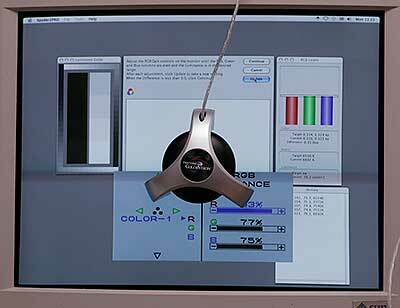 Given my recent foray into large format printing, I needed to dig into the old junk drawer and excavate my Spyder2 Color Calibrator to profile my monitor. It’s been a few years since I last used it, so off to DataColor’s website to download the latest and greatest software. But lo and behold, as has become a recent trend in my digital archeology, the Spyder2 software doesn’t have a version that runs on Mac 10.8.5. Hopes rose anew when I read that I could use the slightly newer Spyder3Express software to run my older Spyder 2 device. Furthermore, DataColor asserted that it’s software (including Spyder3Express) should work with Mountain Lion (OS X 10.8). This has not been my experience. Clicking OK on the second message brought me to the preview screen. Flipping between the uncorrected and corrected profile options did change the display and the change remained after closing the application. But once the laptop rebooted, the default (old) profile was re-applied. From some research on the Interwebs, I didn’t find any solutions but started to suspect it was a permissions issue. A response from DataColor support confirmed this suspicion. I had assumed that the applications was trying to write to /Library/ColorSync/Profiles, which is where I had put all the custom ICC profiles for my printer. Support told me that the app is actually trying to write to /Users/YOUR USERNAME/Library/ColorSync/Profiles/. Problem is that staring from 10.7 Lion, Apple has set the User Library to be hidden. So the solution, is to make that directory writable either temporarily or permanently. I opened up Terminal (Applications > Utilities > Terminal for those who don’t have in in the dock) and cut and paste in the following command. You’ll be prompted for your password. Once that’s done, this will make the directory visible and writable. Next, I navigated to /Users/YOUR USERNAME/Library/ in Finder. There wasn’t a folder called Colorsync as I expected. However, there was a text file with that name. I moved the file to my desktop for safe keeping and then created the ColorSync folder and then the Profiles folder within in. (I’m fairly certain the names are case-sensitive.) Afterwards, I was able to run the Spyder3Express application and get all the way through without error. 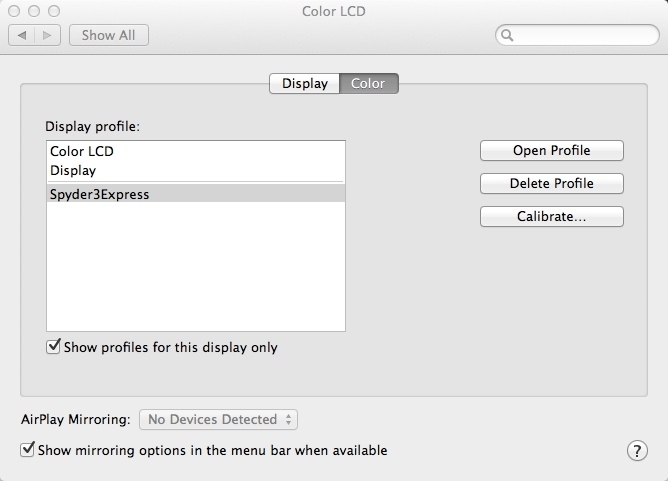 In System Preferences, I could see the new Spyder3Express profile listed. I didn’t do this, because I didn’t want to have to do this everytime I ran another calibration. Open the Argyll CMZ archive file. Copy the newly created folder to Applications. Install DispCalGui– double click the DMG to extract the content. Create new folder called DispCalGui under Applications and copy contents over. Run the app dispcalGUI – It will first ask you for the location of the Argyllcms. It wants the bin folder in the directory you created. 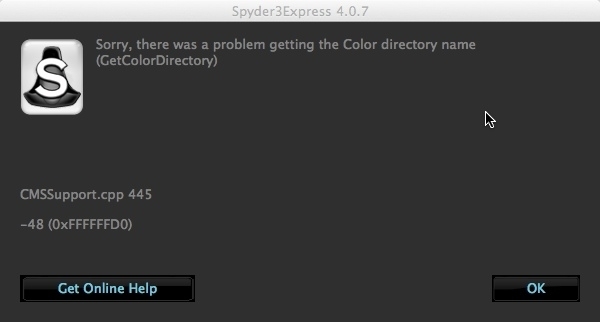 Go to Tools > Enable Sypder 2 Colorimeter. It will ask for the location of the Spyder PRO_2.3.5_Setup.exe from step 1. I had to run the aforementioned sudo chflags nohidden ~/Library command in terminal before it would save the profiles. This seems to be a known bug and may be fixed in later releases. The dispCalGUI is much more complex than the push-button Spyder app but, you have many more levels of control and options to choose from.